Go beyond red cushions this Chinese New Year. The Fortune Cat cushion, $14.90, and Yuan Bao cushion, $12.90, HipVan: Usher in more wealth this year with this auspicious combination of The Fortune Cat cushion and Yuan Bao cushion. Giant Pineapple Tart, $32.90, HipVan: Here is a giant pineapple tart cushion for those who can’t get enough of the calorie-laden snack. Green Harita cushion, $55, Heidi and Home: Contemporary yet classic Chinese pattern in fresh green, the cushion is made of 100% cotton using natural dyes. Asian Chinese Brocade Cushion Cover, $65, Noss.Store: Cover your old cushions with this Asian Chinese Brocade Cushion Cover for a luxurious decor. Handmade in Singapore, the cover is made of premium quality brocade with gold and silver threads. 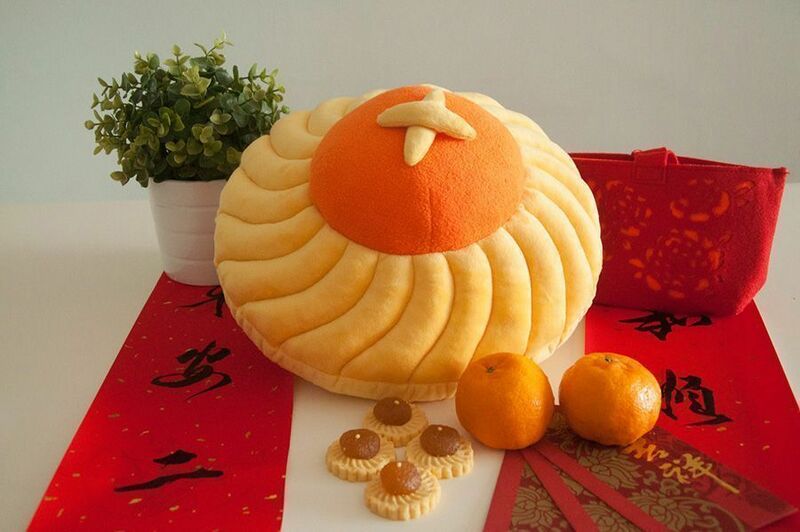 Ang Ku Kueh Cushion, $29.90, Naiise: Translated as “Red Tortoise Cake” from Hokkien, this traditional dessert is a symbolically auspicious food in the local Chinese community. Happiness Candy Cushion, $49.90, The Joy Troopers: The White Rabbit Creamy is a traditional treat given by grandparents during Chinese New Year. The “double happiness” characters on this bolster is a common Chinese ornament design used in decorations and marriages. Asian Vintage Brocade Cushion Cover, $65, Noss.Store: This floral cushion cover is ideal for those who wish to usher in Chinese New Year with symbols of spring and rebirth. Pink Patterned Block Print Cushion, $50, The Joy Troopers: For a modern touch, line your sofa with this cushion printed with contemporary floral patterns. Linen cushion, $37.50, Singapore Trading Post: This embroidered linen cushion with velvet piping adds a subtle elegance to your home. Any more suggestions for fellow homeowners? Email us at hello@cromly.com.